Burnout Dominator represents an unfortunate down point in the series. Since Burnout Paradise is not far away, a final PS2 and PSP exclusive title was launched but was not intended as a true sequel. This is evident in the games back to basics approach, which sees the removal of traffic checking but reverts the boost system to that of the earlier Burnouts, which was a welcome change. Every Burnout has included a new distinct feature, with Burnout 2 introducing crash mode, Burnout 3 incorporating takedowns and Burnout Revenge using traffic checking. 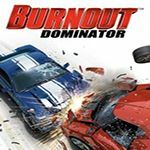 Burnout Dominator however contains no real new features, besides the new maniac mode which encourages dangerous driving, but instead feels tacked on like an after thought. What also sets this installment down from the previous titles is the glaring omission of both crash mode and online play, which are now essential in the Burnout franchise. However, whilst I don't favour these omissions, I do actually quite like the re-emphasis on actual racing, a core feature that seems to have been overlooked since Burnout got EA-ified. There are also notably less cars, but unlike Burnout Revenge there are not as many duplicates, resulting in a more manageable and distinctive collection of cars. Whilst lacking in areas, Burnout Dominator is still a fitting farewell to the current generation of consoles, although Burnout 3 is still my personal favourite title. This burnout a little disappointed me! C'est sur c'est vraiment pas le meilleur Burnout de la série. Game was not developed by Criterion, but by EA UK (a seperate subsidiary of EA), now known as Bright Light. Criterion, though, was credited with the creation of the game, which is seen in the instruction manual, and the old Criterion logo on the Oval Racer. There's the track list sources I've added. From what I remember of this game, they completely changed the driving physics meaning I went into crashbreaker every few seconds. To date, I have not played a harder game. I still take out B3 and Revenge every few months, I only played Dominator once when it was new. Is this the one that had the screen in the menus look cracked after you progressed so far? Or was it Revenge? I remember playing the game when it happened and was like "OH F*** MY TV JUST CRACKED!" Burn Rubber wrote Is this the one that had the screen in the menus look cracked after you progressed so far? Or was it Revenge? I remember playing the game when it happened and was like "OH F*** MY TV JUST CRACKED!" Racedriver43 wrote A few pictures in need of replacement? No problem. If you're trying to get PSP shots, I think we should wait for someone to get shots off the PS2. They would look better. I have vague memories of playing this game. I did previously have B:R on PS2, but I never remember playing, and speaking so, it was most likely my dad's since his PS2 was a hand-down from him to me and my sister. I also remember cruising through a mountain area in a blue car while DJ Atomica was talking in the backround, which left me with extreme deja-vu upon first buying B:3TD, and driving compact type 2 on Silver lake. I feel it may be a modded, or some sort of special disc, and I want to re-surface it, because I can't get past the intro menu, but I feel if it does have that extra stuff, I fear it may get rid of it. I believe Crashbreaker was in every game between Takedown and Paradise. I haven't played Dominator in a while tho. It wasn't in Dominator... That's the strangest part. Nah , Crashbreaker is in the game. I just recently played this game. Edit: Oh! You mean the feature. I'm talking about the Crash Mode. Carnival Point takes place in Brazil, while Red Gate takes place in Russia. Ooh, let's keep my fingers crossed that the blank track entries will be deleted. carcrazedalex586 wrote Ooh, let's keep my fingers crossed that the blank track entries will be deleted. When it comes to tracks, Nothing will ever get changed. there's still a track on SLR:R with a modded name in its listing. Oh yeah, I am totally disappointed that the admins rejected my correct track entries on the BR page. I gave up and I'm scared to do that again. Huh, two days later and they're still sitting there. Don't expect changes. I'm starting to think admins can't even change them at this point.